Including healthy cooking recipes for chicken, for beginners, for two, and for kids/children. Chicken is one of the favorite poultry meats of most people. It's easy to work with and delicious when cooked well. However, the utmost care and hygiene must be used when handling it as it can cause salmonellosis when that doesn't happen. Salmonellosis is food poisoning caused by the consumption of food contaminated with the bacteria salmonella, it is characterized by the sudden onset of abdominal pain, vomiting, diarrhea and fever. But don't let this scare you- just take caution and care when you cook, the usual, wash your hands before you handle food, not leaving food exposed, etc. Healthy cooking techniques for chicken include roasting, grilling (broiling), stir-frying, barbecuing or boiling. Deep-fat frying is not even anywhere close, if you are considering eating healthy, it's nowhere near. So all that chicken from your favorite fast food outlet may actually not be healthy at all if it's deep fat fried, and chances are that it is, most of the times. There are a few who do grill them, and that's an eating out healthy option. Here below is a simple and yet delicious chicken recipe. When you are done, you should have a chicken with crisp skin and juicy, tender meat. It's a succulent, quick, homemade meal. 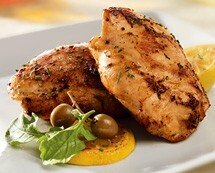 For more recipes go to the article healthy chicken recipes. Mix together the oil, garlic, rosemary, pepper, lemon juice and zest and marinade the chicken and put it in the refrigerator, covered, for at least an hour. (The longer you marinade it for, the more flavor it will have.) But if you are pressed of time, even 30 minutes will do. Pre-heat your oven some 15 minutes before you put your chicken in at grill-bake 160 degrees Celsius or 320 degrees Fahrenheit. Place your chicken in the grill and cook for about 45 minutes or until the meat is tender on the inside and golden crisp on the outside, basting with your marinade every 15 minutes. NOTE- Use tongs when you are turning your meat as you don't want to pierce it and let valuable juices out. Your chicken will dry up on the inside and won't be as tasty. There are also some Chicken soup recipes, healthy grilled chicken recipes, and chicken casserole recipes which you could be interested in. There are a lot healthy cooking recipes for beginners. It's really not a difficult thing to accomplish. In fact, you will be well on your way to a healthy eating lifestyle. One of the most important things to have would be the right attitude towards food and healthy cooking itself. Due to the rise in health problems associated with eating, such as diabetes and high blood pressure which are a result of being overweight, more and more people are looking for healthy cooking recipes, as they want to learn how to eat healthy. Here below is one example of the healthy cooking recipes for beginners. 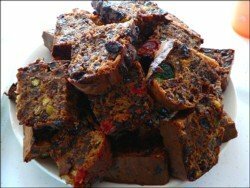 There are many other recipes that you can try out such as simple healthy recipes, healthy family recipes, 30 minute meals, healthy recipes for two and healthy cake recipes. You can even make your own bread from the healthy bread recipes article. As they say- the sky is the limit! Preheat your oven to 350 degrees Fahrenheit/ 176 degrees Celsius on bake. Bring to boil the dried fruit, sugar, mixed spice, water and butter. Simmer gently for 1 minute and then cool. Grease and line your cake tin with grease-proof paper. Stir in the remaining ingredients, that is, the wholemeal flour, beaten eggs, wheat germ (if using), baking powder and bicarbonate of soda. Mix well. Bake for one and a quarter to one and a half hours. Reduce heat to 325 degrees Fahrenheit/ 160 degrees Celsius after 15 minutes. Test with a skewer to check if the cake is done. Serve with a glass of warm or cold milk or with 100% fruit juice. In case you were wondering, there are some healthy cooking recipes for children. Cooking with kids is a great idea. You will not have any problems when it comes to having your kids eat up all their food, including the not so favorite vegetables. When children are involved in the preparation of food they will be eager to taste 'the work of their own hands'. It gives them a sense of accomplishment and responsibility. There are a lot of healthy cooking recipes for kids that you can try for them, but most importantly, with them. Here below is an example of one of the healthy cooking recipes for children, the preparation time is 20 minutes and the cooking time is about 15 minutes, it will serve 4 people. You may get more in the article healthy recipes for kids. 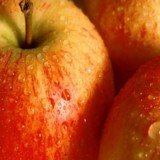 There are also some healthy snack recipes for kids which you can try out with them. Cooking with children will obviously be a messy job, but the benefit of having them eat their food is by far a better result. Cook the pasta twists in a pot of boiling water for about 10 minutes, or until they are just tender. Drain them and rinse under cold water and drain again. Bring a little bit of water to the boil and then add your peas to the water and cook for about 2 minutes or until tender. Drain and rinse under cold water and drain again. Make sure you don't overcook the peas as you will destroy all the vital nutrients. Take the chicken meat off the bones and break the meat into small strips. A knife may be used should you prefer to use one. Put the capsicum, corn, cucumber and spring onions in a bowl. Finally, mix the pasta, peas, corn and chicken in the bowl with capsicum, spring onions and cucumber. Add salad dressing, stir until well mixed. Serve with a green salad as a main course, and watch as your kids dig into the colorful, healthy meal they helped to produce. If your little one is still young, you can check toddler foods, making baby food, organic baby food recipes or healthy smoothie recipes for more ideas. Fruit nutrition and vegetable nutrition facts are important for your kids to grow up knowing, so get them involved in a fun and educational way and see them tuck into their greens. By doing so you will avoid one of the many health problems that other parents are currently dealing with such as childhood obesity. 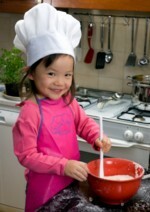 So here's to your little chefs and master chefs in the making. Happy cooking!